What you see isn’t what you get. The process in ceramics is really interesting compared to many other materials. There is this necessity to be able to see into the future as ceramic pigments are generally never the same colour finished as when applied. I am working for an upcoming show at the Burlington Art Gallery in Burlington Ontario. It has been several years since I have made pieces specifically for a show as my daily activities are directed to supplying my own shop. I have the standard items I make for the shop but I have continually experimented with different ideas over the years to keep myself interested, challenged, surprized and sometimes disappointed, but that’s the nature of the game. I have included some pictures of some jars I am working on to give you an idea of this process and the fabulous things that happen when an idea is developing. 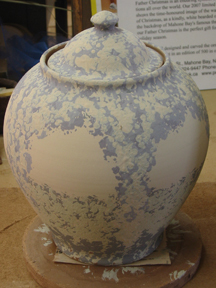 These pieces are decorated with coloured clays that have been sponged (with a piece of sea sponge) on top of the pot. They haven’t been fired in the kiln yet. Here is the first in a series of four. 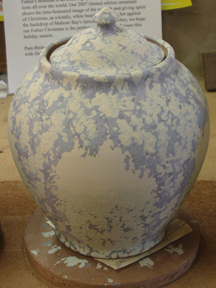 Now here is the next jar, loosening up the slip application around that “window” on the belly of the jar. The dark blue slip will run when the glaze goes over the top so this whole surface treatment will be kind of runny. Bear with me, I know this may be a bit of a leap for some to imagine just what is going on but that is the fascinating, frustrating, rewarding thing about making pottery. I will post these same pictures in their glazed state so that you can see the transformation. Here is number 3. I have sponged the clay more into the “window” hoping to utilize the runnyness of the slip. Underline, hope. I have also substituted a yellow slip for the white slip. Now this is where I wish I had 50 more jars to decorate so that I could go through all the permutations that start to spring to mind. However, as I stood back and looked at the three decorated jars, I had the idea to carve through the initial white clay, that covers the brown clay the jar is made from, to create a kind of trellis/fence for these viney, flowery things to hang on. Here is the last jar. At this point I am not sure how much of the trellis will show as I have sponged the clay over the top of the carving. I am hoping it will be more subtle than strong. Well there is the progression of an idea which challenges the old adage, ‘What you see is what you get”.